Simon Killer (Antonio Campos, 2012) – Masters of Cinema. Fluidity is rife within Antonio Campos’ 2012 film Simon Killer. From its character’s perception of reality to its editing and direction, the film seems in a constant state flux, moving in and out of ideas and emotions as easily as its sociopath protagonist. For a film with such a violent, blunt title, it almost betrays the melancholic, rarely visceral content of the film which seems far more sexual more than anything else. This again plays into its character traits but there is more to the film than a youthful spin on Patrick Bateman which its descriptions often imply. 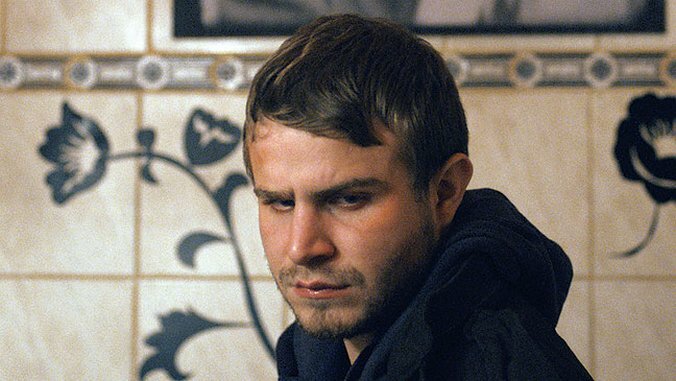 Simon (Brady Corbet) is apparently a student who has just graduated from studying. This studying is said to be of the relationship between the eye and brain but this becomes muddled as the narrative progresses. He is staying with a friend in Paris which is at once a distanced city but more so because of his social awkwardness than anything inherently aggressive. Simon’s actions appear to be driven by the hurt from a recent break-up which is shown in snippets but always from his point of view. Simon Killer is so focussed on its character’s point of view that what the viewer sees appears to be a filter of lies which only begin to collapse along with his character’s sanity. He befriends a prostitute, Victoria (Mati Diop), but not before trying hopelessly to flirt with a pair of local girls on the metro. It is on these occasions that violence threatens to rear its head whether unsure to back down from being knocked into, to seemingly taking on a group of men jokingly insulting him. The fluidity of these emotional snaps makes Simon a tense character to be around. He is seemingly unaware of his actions which appear almost to be forgotten as he compulsively lies his way around the problems he sets himself up with. Victoria allows him to stay with her before seeming to fall in love with him but he seems so absent as a person that his gradual relationship with another girl he met on the metro is unsurprising and doesn’t register. Convincing her to give up her job and to blackmail one of her clients, Simon pushes his own insecurities upon her, trying desperately to spread the guilt he clearly harbours by making Victoria face up to the lives her job undoubtedly breaks up. Simon’s gradual decent into violence is naturally at the periphery of his vision. His studies in the area seem to allow him to put his problems to the sides of his eyes, brilliantly shown through slow editing and colourful visions found to the side of horizontal pans. This same aesthetic can be applied to the violence of the film which is rarely seen to happen but instead cuts away before occurring. This allows Simon to twist what happened in each circumstance to fit whatever story he wishes to spin. The group of men that supposedly took his things and attacked him appear to have only injured his knuckles, implying that they were the worse off in the fight. This power that the character has over the lies within the film make him seem far more dangerous than simply showing what he is capable of would do. This danger is added to by Simon’s distanced positioning to both the city and the characters that he meets. His casual cheating on his new found relationship is one thing; his listening to music almost antisocially as he wanders around the Louvre is another. Music is superbly used, at first seeming to create a montage but in reality it is turning Simon’s life into a montage allowing him the distance to be violent and be cruel to the people who help him. As his lies begin to unravel, his breakdown manifests in violence but more interestingly in almost baby-like cries. He can’t sum up how he feels as he’s back at his friends flat after leaving Victoria for dead so instead he lets out some of his unreleased anger through a guttural cry instead. It seems almost primeval. As the film ends, it shows Simon leaving Paris. He reads another email to his ex-girlfriend over the soundtrack but the fact that his voice also read her replies out aloud hints that she may not even exist or at least may not have replied to him at all while being in Paris. As he is grilled by the immigration officer due to his overstay on his visa, his whole story changes. His studies are no longer in psychology but in French literature (studied by his other girl, Marianne (Constance Rousseau) and his reasons for visiting morph into yet another lie. He seems unsure as to his own identity, grasping onto anything he’s heard in the last few weeks as if moving his actions to the periphery of his memory and vision has also removed the basics of his identity. It completely destabilises the film but, for a piece of cinema based on the lies and deceptions of a sociopathic firecracker, this fluidity was only to be expected. • Behind-the-scenes and rehearsal footage from the production of the film. • Sundance Alumni interview with Antonio Campos and producers Sean Durkin and Josh Mond. • The Last 15 – Campos’s Palme d’Or nominated short film. • The Case of the Conscious Camera – A 29-minute interview with Campos on the aesthetics of Simon Killer. • Conversations with Moms – an interview with Campos, Brady Corbet, and their mothers. • Optional English subtitles (SDH also available). • Booklet featuring a new and exclusive essay by critic Karina Longworth; a new interview with Antonio Campos; a visual primer on the development of the poster art. Portfolio NW – The Bluecoat (Liverpool).